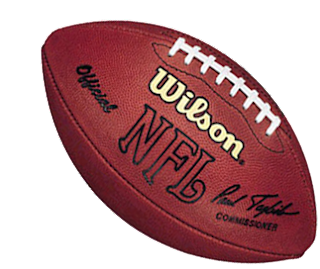 It is the end of the football season, and time for the Super Bowl. I must admit that I was rooting for the San Francisco 49ers to make it to the big game. An east coast, west coast rivalry would have been fun. But how many people really care who's in the Super Bowl? I've heard that something like 80% of the tickets sold, are to corporations, and those people are just there for the experience. 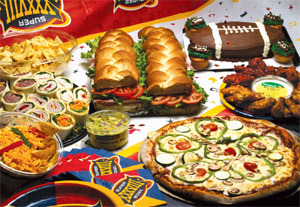 Those of us at home, that don't have a team in the game, are probably there for the commercials, or friends and food. That's were this weeks article comes in. 10. Artichoke Dip - vegetal, creamy - Sparkling wine, Rose (go with a dry style as artichokes make wine taste sweeter). 20. Chex Mix - salty - Beer, Sparkling wine. So, let's look at the count....if you are holding a Super Bowl party, Beer must be on your beverage menu, and if you must pick a style, go with Lager. The next must have is Zinfandel. Go with a lighter, fruitier version. Next would be a sparkling wine. Personally, I wouldn't spend the money on a fine French Champagne for the items on the food list. But luckily there are some decent priced sparklers out there. Next, it is close as to which white wine. You can't go wrong with Sauvignon Blanc, or Riesling (go with a dry version from Alsace or California). So you have beer, red, sparkling and white, let's add a dry Rose, and we should have it covered. For those that don't drink, add some soda. And for those that want something a little heavier, add some Tequila and margarita mix, and you are well on your way to satisfying everyone's needs. Time for the Super Bowl....who are you picking? Giants or Patriots? Last week, my article on terrior sparked a question about what "AVA" stood for. So, this week, I thought it might be worth looking at the United States' answer to the French appellation controlee system. If you read my article from May 2011, on Old World vs New World, then you might remember that French wines are not identified by the grape, but rather by the region or appellation d'origine controlee, or AOC (a controlled geographic growing area). In 2011, the name changed to AOP (Appellation d’Origine Protegee), but the idea remains the same. The name was changed to help standardized the European Union. In the United States, we identify our wines by the grape, or the grapes within a blend. But, we also know that a Cabernet Sauvignon from Napa Valley will taste different than a Cabernet Sauvignon from the Columbia River Valley in Washington. The United States government, under (at the time) the Bureau of Alcohol, Tobacco and Firearms created the AVA, an acronym for American Viticultural Area. 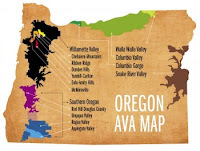 The AVA system, unlike its' French counterpart, was designed to identify geographic locations, where at least 85% of the grapes (and 75% of the named grape) within the wine were grown. The biggest difference with the AVA system, versus France, is that there is no limitation on which grapes can be grown in the area, and the harvest, and methods to vinify the grapes, are not restricted. The very first AVA in the United States was established on June 20, 1980, and is the Augusta AVA (in that "hot bed" of wine...Missouri). 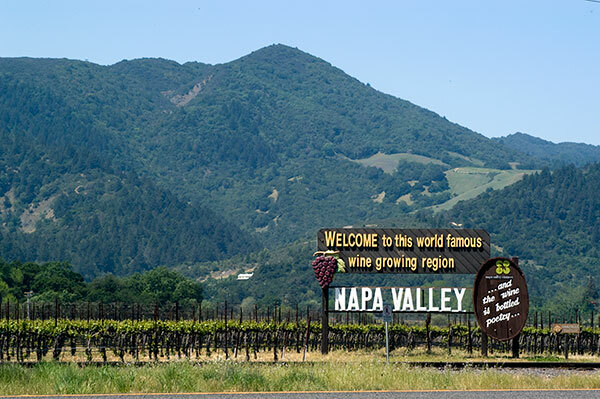 The newest AVA is Coombsville (in the Napa Valley) established December 14, 2011. The total number of AVA's is now 202. For a full list of all the current AVA's check out the list at the TTB website. Petitioners are required to provide such information when applying for a new AVA, and are also required to use USGS maps to both describe (using terms from the map) and depict the boundaries. The AVA system is much less restrictive than its' French counterpart. Some will argue that this is an example of the "wild west", and needs to be more controlled (that would be the Old World argument), while others will argue that it allows American wine makers to experiment, and find out what works best. So, the next time you buy a bottle of wine, check out where its' from. Then check the TTB site and read up on the AVA, and learn a little bit more about what you're drinking. No it's not a four letter word, but "terroir" can sound like one to many wine drinkers and winemakers. I've used this word many times, in a number of my wine articles. But what does it mean, and why does it trigger such ugly arguments? As you learn more, it will become obvious that terroir is a French term. And further, it will become clear that there is no true translation into the English language. The best description for terroir, that I can give, is the all encompassing "sense of place" that a wine has. It is that special mix of soil, climate, aspect of the vineyard (topography), and everything else that can affect the final grape product. All of these are unique to each vine, and remain the same every year. This sense of place contributes to the final wine produced, regardless of what is done during the winemaking process. Let's look at the French connection, and how terroir became such an important feature of Old World wines. If you go back in history, you'll see that grapes were being grown throughout Europe, spread by the Roman Catholic Church. 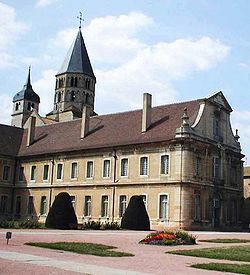 In particular, the Benedictine and Cistercian Monks, with their establishment of abbeys in the Burgundy region of France. These monks kept detailed records of how different plots of land produced different qualities of grapes, and ultimately wine. The best vineyards were eventually identified, and walls (or clos) were built around those plots of land. The monks knew that only certain areas produced the best product, and each plot of land had unique characteristics. They knew that there was a special terroir within each of the identified clos. The idea that unique terroir existed, spread throughout France and the European community. Now, going back to the components of terroir, I mentioned, soil, climate, aspect, etc. As "terroir" suggests, it is tied to the soil. The soil texture, drainage, and the make up of the elements all affect the grapevine, and ultimately the grape. Limestone, granite, chalk, slate and clay are all associated with some of the great wines of the Old World. The soil can retain heat, reflect heat, drain excess moisture, or retain it. The choice of soil for planting affects the total vine. Climate is another aspect to consider. But in the case of wine growing, it is broken down into macroclimate, mesoclimate, and microclimate. Macroclimate can be considered the regional climate, while mesoclimate is more associated with the vineyard. Microclimate is the smallest affected area. This can be a single vine, the space between the vines, or even the small area above the ground, or the canopy. 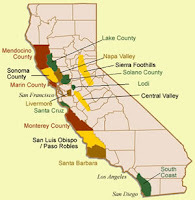 All of these are affected by the aspect of the vineyard, or how the grape vines are positioned on the topography of the land. 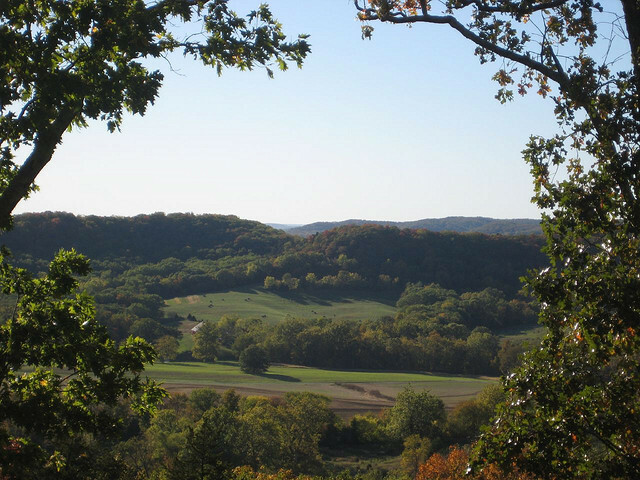 A hillside will drain better than flat land, and a southern exposure will receive more sunlight than a northern exposure. Some other things that might affect the terroir are influences by bodies of water. 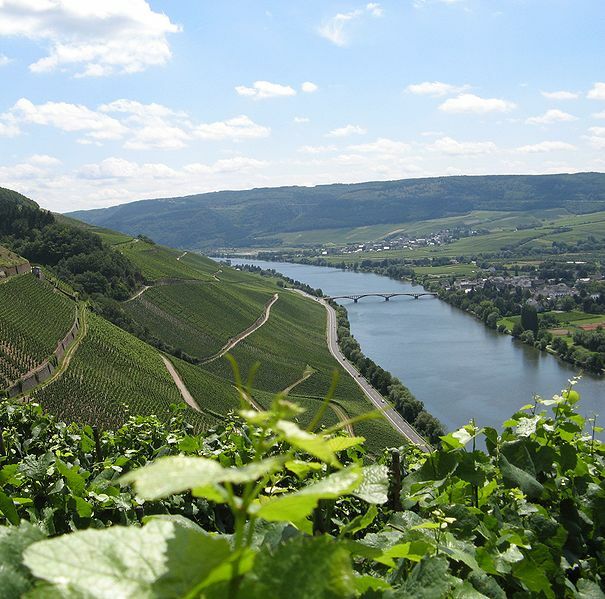 The Mosel, in Germany, is famous for its' hillside vineyards, that are moderated by the river. In Canada, Lake Okanogan moderates the cold region, to allow grapes to grow further north than what would be normal. 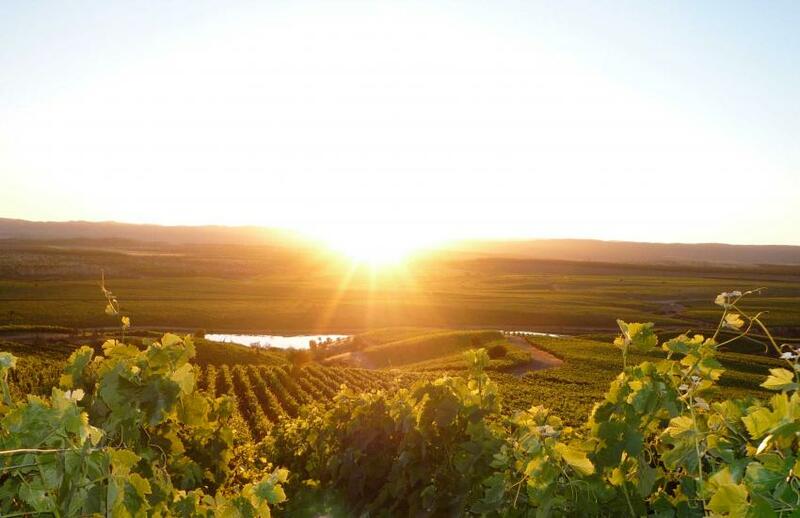 As you can tell, the word "terroir" implies all things that are natural to the place. Where terroir becomes a "dirty word", is in the argument over whether or not it actually exists. The Old World (Europe) has based most of their wine laws on the expression of terroir. In the New World, the emphasis isn't so much on presenting a wine that shows a sense of place, but more presenting a wine that expresses the fruit. If you still are not sure what I am talking about, try a Bordeaux side by side with a Napa Cabernet Sauvignon, or a French Burgundy next to a California Pinot Noir. This also becomes part of the argument for more natural wines, with less manipulation (which we see more of in the New World...I see an entirely new blog for the future here). Some are claiming that there is no such thing as terroir, that it is merely differing levels of sulfur that are present in the juice. I know where I stand on this, and I am a believer in terroir. I can taste subtle nuances from wines grown within the same growing region, but in different areas of that region. 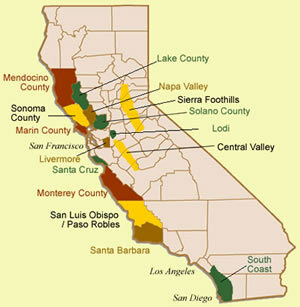 The best example would be Paso Robles (east versus west) or Napa versus Sonoma. Even though they are close to each other, they are all different. So, are you a "terroirist"? Do you seek that sense of place in your wines? I was at a wine tasting over the weekend, that was being held in one our local grocery stores (yeah, I know, standing in a grocery store, tasting wine in the aisles, seems a bit pathetic).....anyway, the conversation turned to where I buy my wine. Obviously, when I need wine now, I do go to my local grocery store (we don't have any wine shops in the area), or if I have some time, I drive to the closest wine shop that carries the variety I prefer. I am a bit picky in my choices, and my pricing. Occasionally, I will stop at BevMo, or Total Wine, but I find these shops are best for liquor and beer, and not necessarily for their wine selection (unless I am only looking for domestic wines... which they both have very good selections). But, when I am looking for a deal, steal, or just downright gotta have it at the best price, I turn to the internet. 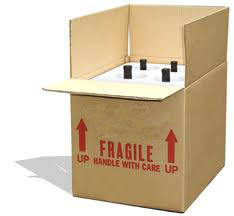 Through the internet, you can have wine shipped to most states, and wine websites are all over the internet. I still prefer to go to my favorite wine shop, and discuss my wine options (and occasionally get a free taste before purchasing). I work too hard to just pay anything for a good bottle of wine, so some specialty websites offer deals too good to pass up (particularly if I don't need the wine right away). Lastly, nothing beats actually meeting with the winemakers at their winery, or in the vineyard. The relationships you build with the people actually working the vineyards, and tending to the wine in the cellar, is part of the wine experience. Most of the time, you can't get out to winery, but sometimes the winery comes to you. In that case, you need to know where and when the next wine event is coming to your town. I have found that www.localwineevents.com has a good amount of information on it. If you have some good websites to share, please add them in the comments section below. We are all looking for a great deal, so might as well "share the wealth". Ahhh...the wonders of the internet community! but don't forget your local wine expert, and their suggestions. This morning I was watching one of those morning "news" shows, and they had a psychic on the show, making predictions on how each of the hosts' lives would be affected this coming year. It got me reflecting on what I've observed over the last year, and what wine trends we might expect to see in 2012. Since I run a wine club, I do have an opportunity to see and hear what people are drinking, and what they think about the wines I've presented at tastings. I also have the opportunity to meet with winemakers, and wine growers. 1. There will be a move to more "food friendly" wines in the New World. 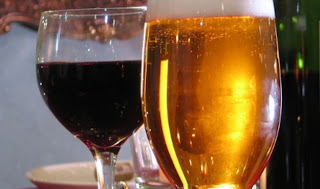 The overly extracted, high alcohol wines will continue to be the show case wines for most winemakers (and certain wine critics), but as the American consumer discovers wine pairing (rather than wine drinking), they'll seek out lower alcohol wines, that pair well with their dinner choices. This is a trend I can get behind! 2. Along the same line, consumers will trend towards more "natural" wines. Those growers and winemakers that use organic or biodynamic grapes, will become more prevalent. Consumers will seek out wines that have less additives used in the wine making process. While we won't see wineries disclosing their ingredients (other than the grape variety and use of sulfites), consumers will begin asking more questions about what additives are in their wine. 3. The move to more natural wines, will also trend to more natural, or environmentally friendly packaging for your favorite wine. We're already seeing the move to lighter bottles and screwcaps. 4. As the economy slowly improves, the average consumer will move away from "cheap" wines, and start searching out "value" wines. Two-Buck Chuck will still be around, but wine drinkers will move up in price. Check out the new Napa wines at Trader Joe's, and you'll see they are already positioning themselves for this trend. 5. Vineyard managers will start experimenting with new grape varieties in the New World. As global warming threatens the growing season for the grapes, growers will look for varieties that grow best in the warming conditions. Now I won't get into the arguments about global warming, but I will tell you that the growers I talk with believe something is happening. 6. 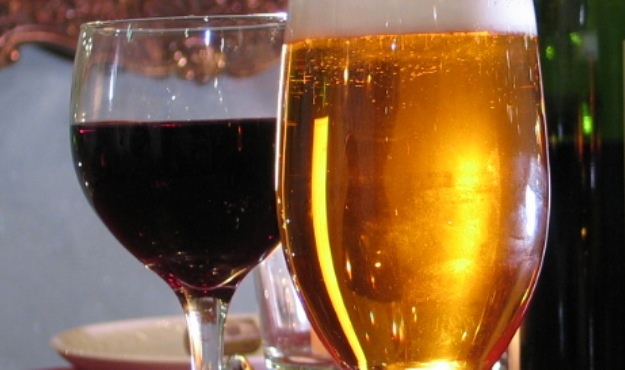 Wine drinkers are becoming more adventurous, and will seek out, and try new wine varieties. It's not just Cabernet Sauvignon and Chardonnay anymore. Italian and Spanish varieties will grow in popularity, and lead the trend to new grape varieties. 7. 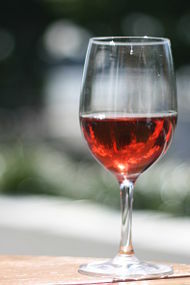 Wine consumers will rediscover Rose wines. Long gone are the Roses that taste like White Zinfandel. Dry Roses of Grenache, Mourvedre, Syrah, and Pinot Noir will grow in popularity. 8. Dessert wines will make a come back. Port and Sauternes have been around forever, but now consumers are rediscovering Madiera, Tokaji, PX Sherry, and Ice Wine. 9. We will see more North American wines from places other than California, Oregon, Washington, and New York. There is a big push for wines from Arizona and Texas, as well as other states. Watch for wines from Mexico. A number of years ago, my wine club did a tasting of Baja California wines (we must have been ahead of the trend)....those vines are now more mature, and the wines being produced are surprising. On top of that, the growing region, in Mexico, is no further to drive to for Southern Californians, than driving to Paso Robles. 10. China will continue to impact the world wine markets. As the Chinese learn more about wine, and consume more (particularly Bordeaux and Burgundy), demand will increase, keeping overall prices high, and supplies of hard to find wines even harder to find. The European investment in Chinese wine production, will eventually break through to outside markets, and we'll begin to see some Chinese wine on the specialty store shelves...I can't say how good they'll be, as I haven't tried any yet, that I thought were good. So, there you have my ten wine trends for 2012. What does this all lead to? More need for knowledgeable wine merchants, restaurant staff, and Sommeliers. If you have the time, take a wine course, join a wine tasting group or club, go to your local restaurant, and talk with their Sommelier. Learn, and grow. 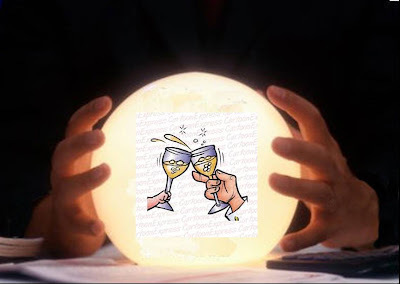 It's you, the consumer, that will determine most of the wine trends for 2012. If I can help, continue to send me e-mails, and add comments to the blog.